Volunteering on Thanksgiving gives chef Thomas Morisette time to reflect on his career and where he came from. “It reminds me why I got into cooking,” he said. The contents of those baskets piqued his interest in cooking. But, he said, it was – at least at that point – really about survival and resourcefulness and making meals stretch. He was 14 when he got his first job in a kitchen, and it guaranteed he got to eat. A meal was provided every shift. 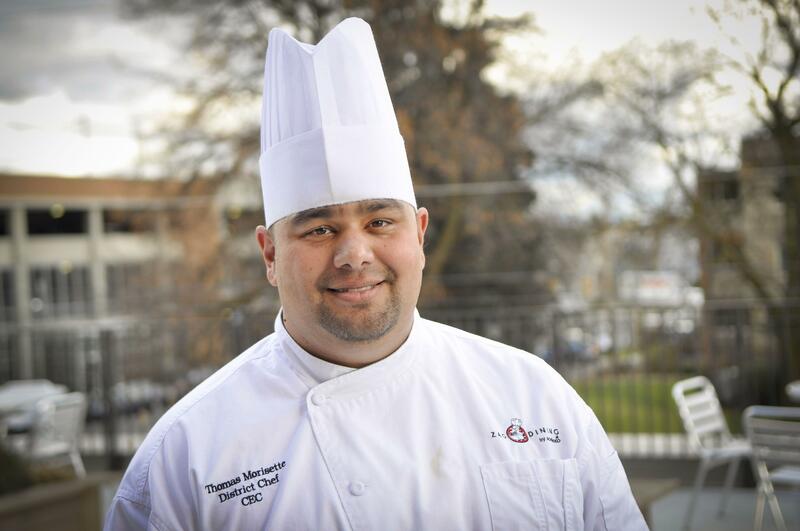 Now, at 36, the father of five – four of whom live at home with him in Coeur d’Alene – the district chef for Sodexo at Gonzaga University is grateful for where his culinary skills have taken him: to a salaried position and a place of food security for himself and his family. Morisette ordered the turkey last week, and this morning, he’ll cook 20 turkey breasts weighing 9 pounds each for a total of 180 pounds in all, plus 150 pounds of potatoes, 120 pounds of stuffing, 120 pounds of green beans and 8 gallons of gravy. Then he delivers it all to House of Charity, a program of Catholic Charities Spokane that provides emergency services such as meals and shelter to people in need. Sodexo provides the meal at cost to House of Charity; there’s no fee for labor or delivery, said Morisette, who aims to have the food there by 10:15 a.m. This will be the fourth year in a row his daughters, Mya, 11, and Isabel, 10, have helped, too. “They pan up the stuffing and help with the potatoes, really simple stuff,” Morisette said. After they clean up the kitchen – the girls help mop – they usually return home around 12:30 or 1 p.m., giving them time to relax before their own Thanksgiving dinner at 2 p.m. The ride provides “a good moment of reflection.” Morisette said he reflects on where he came from and what he has now – and encourages his children to be thankful for what they have.